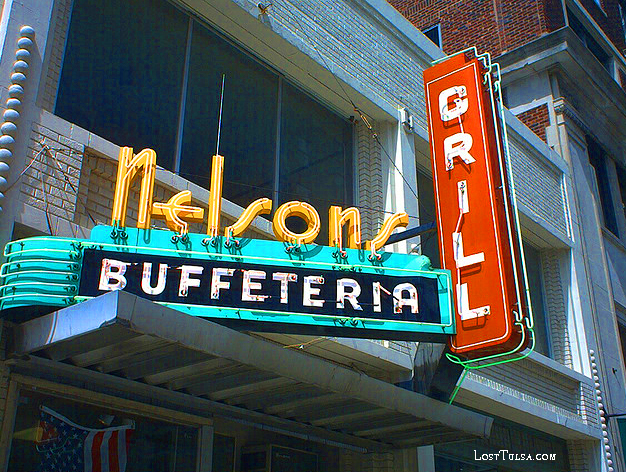 Tulsa Gal: Nelson's - Take Two! This makes me hungry for chicken fried steak. I'm glad to see you posting again after a couple of months. How exciting. Sometimes it really (insert expletive here) to no longer live in Tulsa. The last times I visited the Ranch House, many years ago, it was in sharp decline. Glad to hear it still exists and serves up a good meal these days. Hooray, Nancy,for your great detective work!!! Now I know where I'm eating lunch next time I'm in Tulsa! Thanks everyone. I get hungry just thinking about that place. Today the line was out the door and down the walkway when I drove by at lunch. Visited the downtown Buffeteria while working in Tulsa, loved the food and staff and the band. Glad to know it's back and stronger than ever! I'll drop by when I am in Tulsa, for SURE! Read in the Tulsa World classified ads last month that the downtown business was for sale. $35,000 as I remember it. Went there once and thought it was just OK. Still want to try the one on Memorial. I've heard that it is most like the original. Yes, the Memorial Nelson's is most definitely like the original. Too bad the other one couldn't make it. Is this the business that used to be in Utica Square? I remember living the highlife in the early 60's visiting a popular buffeteria there, and have been trying to remember its name.